It’s easy to recall an image of a Jeep Wrangler without too much thought or even a reminder. This is thanks to Jeep’s painstaking awareness in terms of branding and keeping true to the original design. Although Jeep has a similar look on the outside, there are subtle changes across the board to customize the experience for their varied fan base. For the fans, this means having access to their favorite Jeep without compromising on that iconic boxy shape. Discover which option is the ideal fit for all kinds of Jeep fans. When it comes to the epic outdoor adventure, Jeep is right in the middle of it thanks to engineered suspension and larger-than-life wheels. The Zipperless Sunrider Soft Top simplifies the transition to ensure drivers can get the top back up quicker than ever before. The 2.0-liter direct-injection turbo engine provides 295 pound-feet of torque. After that wild adventure, cleaning up is a breeze thanks to the wash-out interior feature. Drivers choose between a two-door or four-door option. Those who want to take on more than just bundu-bashing will find the Sport S a great fit thanks to the 3.6-liter Pentastar V-6 engine. Drivers can expect 385 horsepower and 260 pound-feet of torque. For more rugged conditions, the optional Freedom Top three-piece hardtop allows a sturdier canopy. Drivers can rely on superb technology to get them from point A to point B thanks to the Uconnect 7-inch touch screen that integrates seamlessly with Apple CarPlay and Android Auto. Safety features include blind spot monitoring, ParkSense rear park assist, and rear cross path detection. While this model still has all the rough-and-tumble features of the Sport and Sport S, it provides that extra layer of sophistication for those who love the brand but adventure only happens once in a while. Drivers have the option of going with the Sky One-Touch Power Top to accentuate the body-color hardtop. The refined cabin houses innovative technology such as the Uconnect 4C NAV with an 8.4-inch touch screen. The exterior boasts 18-inch aluminum wheels and body-color fender flares and side steps. This beast is simply not satisfied being parked in a driveway somewhere, as it’s built for the ruggedness of an untamed landscape. There is no need to make any changes to the Rubicon before heading out because it’s off-road ready. Tru-Lok front and rear electronic locking differentials are essential to the ultimate adventure to allow just the right amount of traction. The Rubicon is known for its ability to crawl and has sublime articulation during descents. The heavy-duty 4:1 low-range transfer case seals the deal to manage low-torque situations without burning out. The 33-inch all-terrain tires are the finishing touch. While Jeep is the ultimate outdoor vehicle, there are slight nuances among drivers. The ability to choose the right Jeep is a mark in the company’s favor. 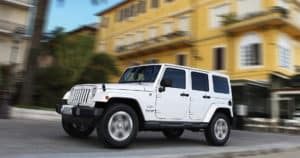 Get more 2018 Jeep Wrangler info here.